I didn’t know about the Montana brand till I read the “Top 10 discontinued male fragrances” article on basenotes.com. Montana Homme is amazing; I bought the cheapo 50ml traveller’s kit for $12 and later bought the 100ml as my first ever backup bottle for an equally cheap $20. (Note: it has been reformulated, if you are interested, get the one in the red box.) Montana Parfum de Peau (1986), the women’s version, however, didn’t make the top 10 list of discontinued women’s perfumes, and it’s a shame. I blamed its modest minimalist packaging, for the longest time it didn’t get any of my attention whenever I visited a perfume shop. But, eventually I heard its weeping sound and looked up and saw it sitting on the top shelf, and decided to bring it home. I’d say it’s one of my best blind-buys. First of all, the bottle rocks. 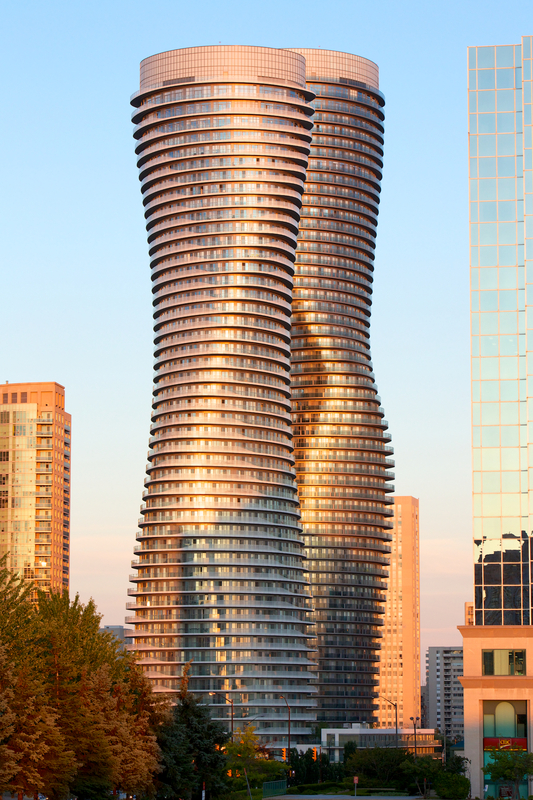 Folks who live in Toronto probably know there is a pair of very famous condo buildings nicknamed Marilyn Monroe in the neighbouring city, Mississauga. The bottle of Montana Parfum de Peau looks crazier than those towers, and not to mention it was designed in 1986, not 2006, without the aid of industrial design software. The scent itself, is another big surprise. I’d say I feel very satisfied when I am wearing it – nothing seems missing and it’s very “full”. Almost like going into a hot bath with the perfect water temperature – a little bliss. I didn’t analyze of the genre of the perfume when I first applied the perfume, for there was so much going on – most noticeably black currant leaves, blackberries, pepper, marigold, aldehyde, the heavy floral top notes hitters, followed by another wave of thick layer of floral mix middle notes; only two hours later I realized it’s a leather chypre. Strangely, it reminded me a little bit of Estee Lauder’s White Linen, except half-way through rolling in the giant bed you realized it’s Brown Linen for someone who wore a leather jacket had slept in that bed before. A friend recommended a bunch of perfumes to me and I took the list to the perfume shop for inquiry. Montana was on the list; I had never heard of it before, but it didn’t matter, because the salesperson told me that it was on sale – 50ml perfume (pre-reformulation?) + soap + aftershave + deodorant + travel pouch for… $12.50. Deal! When I reached home and opened the box and saw the bottle, I smiled – what an awesome looking bottle (my coworker thought it was ugly)! 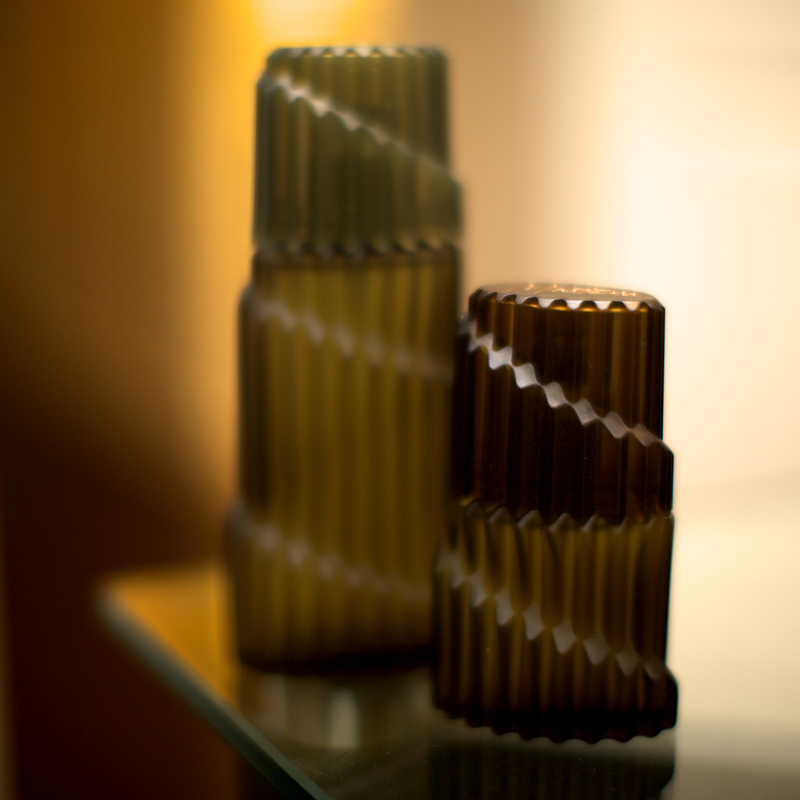 It reminded me of some art deco czech republic amber glass lamp shades. The scent was the second surprise. A light masculine leather scent with great floral and a little bit of aldehyde and spice. I brought the bottle with me to work and reapplied when I went home because it’s quite addictive!